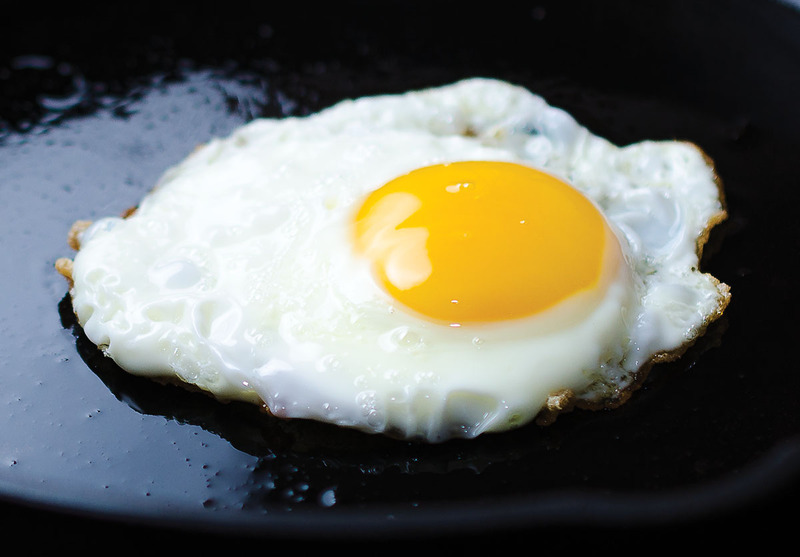 Oh, how I love an egg fried in sizzling hot coconut oil! The edges crinkle and brown like ruffles, and in just three to four minutes, the yolk reaches the ideal consistency: no longer liquid, but not quite solid. It’s tender and flavorful and luscious. But you know what makes something good even better? Good stuff on top. In no particular order, here are 10 recommendations for stuff you can put on top of eggs. Whether you like ’em fried, scrambled, poached, or folded into an omelet, these toppings will ensure that your humble eggs become something special. A generous sprinkle of dried chives, along with salt and pepper, adds a light, oniony kick without being overpowering. Fresh parsley, crushed red pepper, extra-virgin olive oil. Instant Italian flair! The bright, grassiness of the parsley is mellowed by the olive oil and gets a zing! from the red pepper. Homemade mayo, finely minced dill pickles, a sprinkle of paprika. Almost like deviled eggs, only more comforting ’cause they’re warm and luxurious. The contrast of the cool homemade mayo with the warm egg is the secret that makes it irresistible. Chipotle peppers in adobo sauce. Smokey, spicy goodness in a snap. Just mince a pepper with some of the adobo sauce until it forms a smooth paste and dollop on top of the eggs. You might add a slice of avocado to cool the heat. The creamy nuttiness of the Sunshine Sauce sings against the backdrop of a simple egg. Sings! Coconut aminos (or homemade substitute), Chinese five-spice powder. Dig into the umami of a few drops of coconut aminos and a pinch of spicy-sweet five-spice powder. Bonus if you add sliced scallion greens. Slice a strip of raw bacon into 1/4-inch pieces and cook until crisp, then toss with a little finely-minced tomato to make a relish that’s better than traditional bacon-and-eggs. Finely mince a piece of apple, then sauté it in coconut oil or ghee until it’s tender, about 5 minutes. Sprinkle with a pinch of cinnamon and a pinch of salt, then spoon on top of hot eggs. You would not be remiss if you added crumbled bacon to this one, too. My topping for eggs is more than a topping really, it is more of a mixture. I love to take left over spaghetti w/meat sauce and mash it or chop it up, then put it a hot skillet w/a little oil or butter get the spaghetti hot then pour in 3 or for beaten eggs and scramble the up till the eggs are done. Then put them on a plate and salt and pepper to taste, yum yum yum. I have many more ingredents I have put in eggs. I recently got garlic scapes at my farmer’s market- I sliced and sautéed some and put it on eggs with goat cheese (but it would be great without the cheese I’m sure). Tomato paste / sauce + crushed red pepper … and maybe (if you’re naughty) some shaved parm. It takes a wee bit of prep, but we love to simmer onions, celery, and garlic slices with a tomato or two until it’s all soft and thick. Sliced and sauteed fresh mushrooms are also a favorite here. There’s an israeli dish like this: once the tomato base (with peppers, garlic, onions) is nice and thick and bubbling, crack your eggs right on top and let them cook sunny side up. Eat out of the pan. Amazing. Do you say to eat it out of the pan because no one should be made to wait for plating? 😉 I am going to try this, it’s making me drool. Another simply delicious option. If you have made the Moraccan meatballs from the Well Fed cookbook, make extra sauce. Get that to a bubbling hot temperature stir, bubble again then crack eggs on top of that. By making extra sauce you get two flavorful meals with only one big prep! Full Fat Greek Yogurt and salsa! My favorites toppings are salsa, guacamole or pesto! I love making huevos rancheros (minus the corn tortillas!) Although now that I’ve successfully made mayo (thanks to YOU!) I will have to try adding that to my eggs! Yum!! Great ideas! Definitely avocado, ham and salsa. I made some this morning and traditionally bring it to work, but it smelled so good and the traffic was so bad, I ate it in my car 🙂 Yummy (yet safe!) multitasking. OK – #3 is how I eat it ALL the time! I swear, people are skeeved by pickles with a hot egg. But when you break the yolk? Its a BIT like heaven! Your/Well Fed’s Chinese 5 spice stir fry sauce. I usually plop an entire can of sardines down on top of my eggs, and top that with an obscene amount of cracked pepper and hot sauce. Then mayo on top to cut the heat. Then shovel. Under the egg…fried in duck fat. On top…chimichurri. Just made a perfect batch of mayo (I say a little “thank you, Mel” every time) so will have to try the sardines or “deviled” egg idea this morning. I need my whites COMPLETELY cooked and my yolks runny, so I use the tip of a spoon or knife to move the whites around, then when they’re solid, flip the egg for a few seconds. Breakfast time right now!! Eggs on top of diced and sauteed onion, beets, zucchini, and kale + a slice of fried tomato. YUMMMMM!!!! tony chachere’s creole seasoning! good on everything! Fried eggs have been rocking my face lately. Recently I stuck one on top of a turkey burger. If heaven had a taste, that would be it. Lately I’ve gotten into the very hedonistic habit of whipping up a hollandaise sauce for one. I like to just use one egg yolk, then add the white to the two other eggs I’m poaching– no waste there. It is SO good, and compared with the pleasure, not much work! Bonus points for putting it all on top of greens from the garden! Sprinkle some dried dill on there….mmmmmm. Sliced or diced avocado (smushed if they are soft enough) on a plate with the eggs on top… Crumbled bacon on top… chipotle mayo (your recipe of course) for dipping with freshly cracked pepper & Himalayan rock salts… deeevine. Mole Verde! Whip up a batch on occasion during the weekly cook up and it is great on eggs, meat, etc. Grate a zucchini, saute in olive oil till soft and sweet, add your eggs… To die for! Under poached or over-easy eggs, I love leftover yams (especially w/chipotle powder) or winter squash with arugula dressed in olive oil, sea salt and lots of cracked pepper. The above are good together as well. I also have a technique where I take a given veggie and sauté it in the pan with a fat of choice while the pan heats for the egg, when the veggie is nice and wilted/softened/caramelized, put it on a plate, fry my egg(s), then slide the done egg on top. (Or mix scrambled eggs in the pan with the veggie). *spinach, chard, kale, turnip etc. My final technique requires a bit of advance planning. I roast tomatoes with various veggies when they are ripe in the summer and then freeze the delicious results (spread very thinly in a gallon freezer bag). I can break off a big chunk, nuke it in the microwave oven while my eggs cook, and serve it all up. My favorite at the moment is roasted tomatoes, jalapeños, onions, garlic, and cilantro. Hot and yummy. Then one day I went really crazy and had the roasted tomatoes/chiles/onions with avocado chunks and sautéed cabbage. Utterly awesome. I’m excited to try some of your suggestions, but I would also love to see a list (or several) of non-egg containing breakfasts. We raise our own eggs, and it’s a bit of an ebb-n-flow over the year with the amount they lay. Additionally, I’d like some breakfasts that just aren’t eggs. When the girls are laying in the spring, one can get a bit egged out. LOVE these =) And I love that you’ll be posting awesomeness on Tuesdays! yippee! Eggs W/chopped sweet potatos and onins. On a weekday; definately with salsa, hot sauce and chopped avocado. On the weekends, though; with paprika and parsley saute’d in butter and a dollop of greek yogurt with garlic mixed into it. Scrambled eggs with salad greens and balsamic vinaigrette (basically olive oil, balsamic and salt/pepper) on the side. Definitely balsamic vinegar, mustard and approved hot sauces! So weird, but I love it! Avocado, sauteed mushrooms and salsa. MMM! I just started the Paleo solution for autoimmunity and I can not have eggs. I would like to try the meatball recipes in the Well Fed cook book and need a substitute for eggs. Help!! Hey, Deborah. For the meatball recipes (and the eggplant strata) in Well Fed, just omit the eggs. They’ll work just fine. Adding the egg to the meatballs makes them slightly more tender, but they’ll taste great without the egg. If you want to make the texture a little softer, you can add 1/4 to 1/2 cup almond flour, but it’s not necessary — and that makes them questionable for Whole30 compliance. My advice is to just skip the egg. Salt and sauteed spinach are my current favorites, but I am going to try the garlic ghee, that sounds so good! Hummus and eggs is fantastic! Or better yet, I make a sauce by mixing hummus with some dijon mustard and thinning it out with water. Amazing. Definitely read this as “things to put eggs on” which I was super excited about because I put eggs on everything. This is just as good! I like carrot-kraut on mine with ginger and lots of black pepper. The best new egg thing I tried… diced prosciutto, mushrooms, black olives, rosemary, and kale with a nice duck egg on top. “poached” in a microwave at work. Fresh basil and avocado slices. A bar local to me serves locally raised beef burgers with horseradish cheddar, on which you can add a fried runny egg and/or sticky spicy bacon (does use sugar, worth it). I’m going to start getting them w/o the bun because who needs it? The combo of juicy beef, rich yolk and sweet heat is amazing. I want to make all the suggestions here, I feel a brunch coming on! So many tasty ideas here… thanks for sharing, everyone. Keep ’em coming! I have been looking for chipotle peppers in adobe sauce that doesn’t have sugar added where o where is it miss Mel? I fry one slice of nitrate-free bacon, and when it’s done dump the eggs into the bacon fat. Top with Penzey’s Greek seasoning and cook ’til done (I scramble, but it would work fried, too). My alternate choice is salsa. You convinced me…I need to try truffle salt. Sautéed asparagus is my favorite at the moment. Bib Bim Bap: no rice. Involves sauteed greens with garlic, thinly sliced steak, kimchi, a dash of sesame oil, with a fried runny egg on top. Holy crap, so good. Bib Bim Bap: no rice. Involves sauteed greens with garlic, thinly sliced steak, kimchi, a dash of sesame oil, with a fried runny egg on top. Holy crap, so good. Don’t forget the siracha! I scramble my eggs with a little bit of coconut milk, thrown in some diced pear, and top with salt. It’s so good. I love truffle oil and a sprinkle of herbes de provence on either scramble or fried eggs. My second favorite is Kalua Pig fried in coconut oil, nice and crispy, but only with fried eggs. Kale sauteed with onion and bacon-fried egg goes on top! Yum! On a whim I threw slivered almonds on my eggs with a bit of salsa – I think I just discovered a paleo sub for tortilla strips! Cumin + Cayenne and a little S & P are my favorite. I’m definitely a fan of these top 10 lists! Sweet potato chunks fried in bacon grease with red onion slices, added to US Wellness Meats pork sausage. The best topping for over-easy eggs ever!! 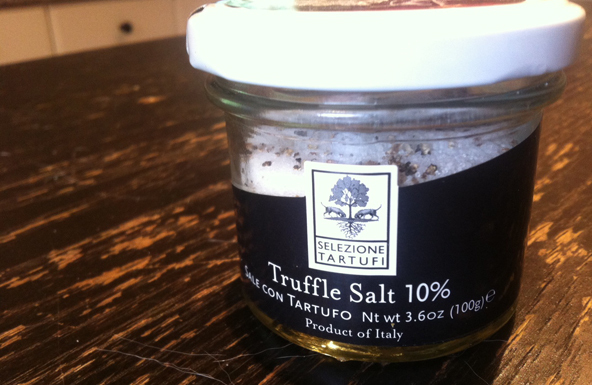 you talked me into ordering the truffle salt – two of my favorite items mixed together has to be great! Oooh… yum. Hope you enjoy it! Pesto or Mexican-style red salsa are some of my faves. Gonna have to try that truffle salt, though! Fried egg sitting on top of sauteed sweet potato, onion and sausage then get the whole thing swimming in a ladle full of green chile. I like salsa on scrambled eggs but green chile on fried eggs is the bomb! Penzey Spices “sunny paris” is amazing on eggs! Not on top of, but mixed in: Methi leaves. This is the plant that grows from fenugreek seeds. You can get a box of dried methi leaves at an indian grocer. Just smell the box and you’ll know you are in for something good. Mix them in as you scramble some eggs and you’ll wonder why everyone doesn’t know about this. Yum. Why do you have ghee in your diet when it is a form of diary? Because ghee is clarified butter, which means that the problematic proteins have been removed and you’re actually left with a very healthy food, which is even approved of by the creators of whole 30, Dallas and Melissa Hartwig. A lot of people make the exception for ghee. Homemade mayo and wasabi. Tasty and clears your sinuses, too. Try it! I would love to try that truffle salt, but that indulgence will have to wait until next week! I LOVE this. So many good ideas. If I could add one: I just discovered harissa, ghee and salt on top of a fried egg. Hollandaise! I use Julia Child’s recipe in The Art of French Cooking. Is amazing on… everything? Today’s breakfast: salmon cake, topped with sautéed spinach, topped with egg fried in duck fat, and a dollop of cumin lime mayo. So, so good. Zatar. Either sprinkled on top or mixed into scrambled eggs as they’re cooking. I love eggs on top or under of so many things…sauteed chard and mushrooms with fried eggs on top, sauteed brussel sprouts in bacon fat then throw some eggs in the pan and fry ’em up, piparrada, a Basque specialty, is another great dish. Salsa is a favorite of mine, also mushrooms. Favorite combo of mine is to cook bacon and set aside, then put a couple mushrooms chopped up in the pan and get them going then add eggs. Works so good it makes up a couple breakfasts a week. Good ideas! I’m always looking for ways to switch it up with my fried eggs. Lately I’ve been sauteeing a tiny bit of salami in coconut oil, adding tons of kale, and plating it with a squeeze of fresh lemon, topped with my eggs. Heaven! favorite stuff to put on eggs? I have a 4″ skillet, I’ll pop some chopped bacon in… as soon you flip the bacon, toss in an egg (or two if they’re small) – sprinkle some chopped serrano peppers on top before you flip the egg… yum! I LOOOOOOOVE eggs on top of chili with a slice of avocado!!! I’ve been eating it for bfast on top of your chocolate chili! HEAVEN!!! Highland Foods Maple Pepper with Habanero. A nice little kick. I keep it simple–sliced avocado and sea salt! And fresh pepper. I don’t like when things like salsa make the eggs colder. =( I like to keep them warm as long as possible! I love my eggs over hard with guacamole and a dash of hot sauce. Just made scrambled eggs topped with my homemade creamy potato soup. I scramble the eggs with some spicy sausage. Put that on a slice of toast, ladled the soup on top and sprinkled with grated 4-cheese pizza blend. For a garnish, sliced green onions, hot sauce. You can omit the toast. Delicious and filling. So I made Doro Wat last week – had leftover sauce that I’m planning top my eggs with in the morning – my mouth is watering just thinking about it! New to this eating style …but enjoying …for eggs..i throw in and sauté a variety of vegies but add chestnuts…love them..then put egg on top..if the vegies are left over..often add lettuce with soft boiled eggs. So, maybe lime with that truffle salt would be a most excellent combination, too. That sounds fantastic! Thank you so much for sharing that link! Can’t wait to experiment with those ideas… the layering of flavors sounds amazing. Lizard Sauce is not on the list? TRAVESTY!! Guess it’s time for an update!